I was pretty excited when I saw Sindie Pop had a Mystery Gang collection out inspired by Scooby Doo. Scooby Doo was hands down my favorite cartoon from probably ages 8-11. I know I watched it on Cartoon Network every night no matter if I had seen the episode before or not. I also had sleepovers with my childhood friend Allison where we'd watch Scooby Doo marathons all night! Sigh, I miss childhood. Anyways, I picked up Zoinks! from this collection. Zoinks! 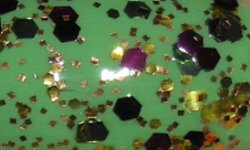 is a mixture of lime green, gold, and red-violet glitters in a clear base. Back to Scooby Doo...My favorite Scooby Doo series was definitely Scooby Doo Where Are You? My favorite episode was Bedlam in the Big Top. Clowns always freaked me out, but I loved this episode. Ahhh creepy clown! 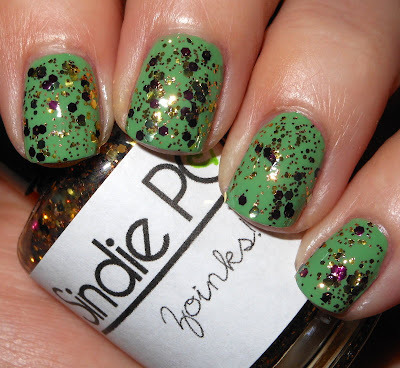 I purchased this polish for $9.00 on Sindie Pop! Lacquer's website. **NOTE** Mystery Gang Collection Restock will be TODAY @ 12pm PST! Be sure to follow Sindie Pop! Lacquer on Facebook, Instagram, and Twitter. Were you a Scooby Doo fan? What was your favorite episode? I would buy this glitter on the name alone ;-) zoinks! This is an awesome glitter!!! And I love green and gold together!! Love this mani!! And yayy for Scooby Doo.